“Doing the work” before you reach professional status in a creative field is often self-directed. You could let that question drain your energy as you try to explain yourself. You could let it distract you. You could let it stop you. Here’s a story of a young artist who, through a dedication to his craft, got a life-changing opportunity. On top of all of that, he was making split-screen videos of humorous commentary alongside cooking tutorials. After one went viral, Ellen DeGeneres invited him on her show and surprised him with a business deal to make his “Kalen Reacts” clips for her audience. A few weeks later, after moving to Los Angeles, Kalen returned to Ellen and gave her audience an update. The following is speculation, but my guess is that this appearance on national television wasn’t the first time he declared that. It was a mindset he had already embodied and an attitude he projected. Feeling confident and capable about your own abilities puts others at ease, which likely enabled the contract the show offered him. Is a label really that important? Now, it’s pretty empty to call yourself an “artist” if you have little to show for it. That’s not going to get you very far. Similarly, titles you want other people to give you can be distractions. What I didn’t mention earlier is that “doing the work” in a creative field even after you reach professional status is often self-directed as well. You might have a team and more resources, but the ability to work autonomously is just as relevant as it was when you were putting in your dues. Now that Kalen has a large platform, his work has just begun — and the habits he’s already cultivated position him for further success. 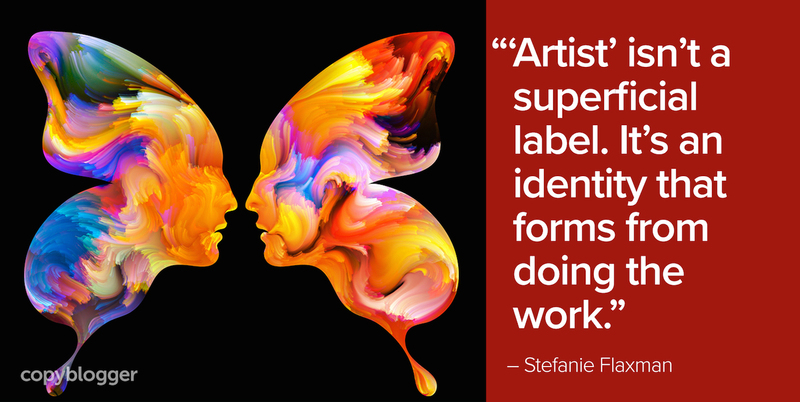 “Artist” isn’t a superficial label. It’s an identity that forms from doing the work. It’s like we say in my world. Authors park their butts in their chairs and write. Thank you for this. It’s a really encouraging story. It’s hard to keep on juggling with all your passions and the necessary stuff in life (like a job to pay the rent). Especially if you have little self-confidence, it can be really difficult to take yourself and your work seriously when others around you don’t do so. Articles and stories like these are super helpful and motivate me to keep on going no matter what. What an inspiring story. This is my first time hearing about this. You are so right. You have to be super duper confident in your abilities and what you can bring to the world. You have to know who you really are and what skills you have mastered – this is a true artist. Confidence is powerful and also attractive. Self-confidence is powerful beyond all that and more. I think the same would be with blogging. You have to become a confident blogger and master your craft. Master the topics in your niche and say it out loud with a lot of confidence, “I am a blogger”, right! I have to thank you for this story, its very encouraging to me. As an artist attempting to create a full time business out of my passion it can be hard to keep the confidence high and keep working to further my art. I’ve been trying to nail down how to attract more people to my business to people in written form and its been causing me to introspect. During this process i’ve been taking a deeper look at myself and how I keep my confidence up and articles like these help a ton! Thanks again for sharing this story!